This Review is by Hamish Smith, who writes at The Geisha Boy. 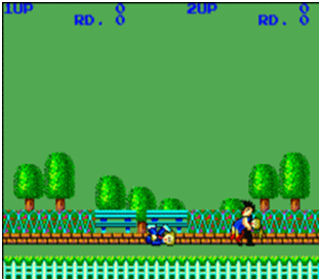 My Hero is a very early side scrolling beat ‘em up for the Sega Master System. It has very simple game mechanics and the graphics are about what you would expect for an 8bit title released in the mid 80s. The game opens to a scene of you (the Hero) on a date with your high school sweetheart, when some no-good rotten punk comes along, gives you a sucker punch and makes off with your pixilated companion. And thus begins your quest to save your girlfriend. The “plot” only really serves as a way to set the stage for the game itself. There is no dialogue or character development. It’s not that kind of game. 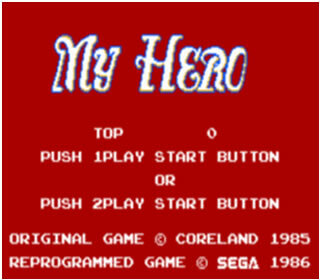 My Hero was first appeared in the arcades in 1985 before being ported exclusively to the Sega Master System in 1986. The game was released quite early in the system’s life cycle and has a slightly more old school feel to it. The game was published by Sega, but was designed by a company called Coreland, which would later go on to become Banpresto (and eventually sell its soul to Namco). Pointless piece of trivia: the company now makes arcade prize machines for a living. The main villain of the game quite literally has a small army at his disposal. Seriously, I would love to know where he finds these guys. You really have to keep your wits about you when playing this game as one hit and you’re out. Luckily the controls are quite fluid so the whole game really boils down to timing your attacks. You have three fighting moves in My Hero, a stock standard punch, a leg sweep and a flying kick. The first two moves are adequate, but the flying kick ultimately makes them redundant. For whatever reason, the collision detection when fly-kicking someone in the head is really forgiving, meaning that with a little practice you can start taking out a couple of baddies at a time. As is the case with most games in existence, My Hero gets increasingly difficult as you progress. Difficult to the point of making you want to put a cricket bat through your television set. It is so difficult that you earn points simply for moving forward. To me that’s like passing an exam just by showing up, however for a game like this one needs all the help one can get. There are also a few platform jumping sections, complete with fireballs, bombs and flying fire bombs, but to call this game a platformer would be bit of a stretch. I have never finished this game myself; however I don’t think it can be finished. I am almost certain that the game simply repeats in a loop for all time, meaning that you NEVER GET YOUR GIRLFRIEND BACK. Or rather, every time you rescue her, she gets kidnapped again. This turns the game into a bit of an endurance run, but doesn’t take away much from the fun. And it is a lot of fun. The game is addictive in a really strange kind of way. It will probably bring you to a blood boiling rage due to the sheer difficulty, but it won’t make you want to throw down your control pad in defeat, either. And that, for better or worse, is the sign of a well designed game.